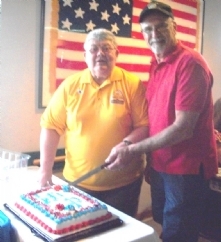 VFW POST 2678 - Veterans of Foreign Wars - Promoting and Assisting Veterans of Foreign Wars. Chartered August 23rd 1932, Wells-McComas Post # 2678, Veterans of Foreign Wars, is named after two young soldiers from the War of 1814. Private Daniel Wells was 19 and Private Henry McComas just 18 when they served as sharpshooters in Captain Edward Asquith's Militia Rifle Company. As Major General Robert Ross marched his British forces towards Baltimore, Privates Wells and McComas mortally wounded him, stopping the enemy's advance during the Battle of North Point. The two young patriots were killed; but, Ross' death is credited to saving Baltimore from falling to the British. Veterans continue to honor the memory of Privates Wells and McComas and the importance of the Battle of North Point with the community's annual Defender's Day Celebration held at Fort Howard Park on the seconded week in September. The Veterans Administration announced the application process for the Veterans Identification Card is now available.